Clinique is offering a cosmetic pouch as its free gift with a minimum spending of $65 worth of Clinique products at Saks. Saks is a luxury American specialty store owned and operated by Saks Fifth Avenue Enterprises, a subsidiary of Saks Incorporated. It competes in the high-end specialty store market in the Upper East Side of Manhattan. Clinique is a manufacturer of skincare, cosmetics, toiletries and fragrances, owned by the Estée Lauder Corporation. Clinique makeup is known for providing cosmetic users with gentle makeup and effective skincare. Their makeup is one of the top brands known for women worldwide. Clinique makeup is allergy tested to provide healthier beauty products for consumers. This cosmetic pouch is attractively designed to appeal to the female segment in the beauty industry. It is spacious and can be used to store many cosmetic products. Thus this makes a great complementary product for Clinique’s cosmetics. Other than cosmetics, users may use this pouch to store other things, such as accessories. 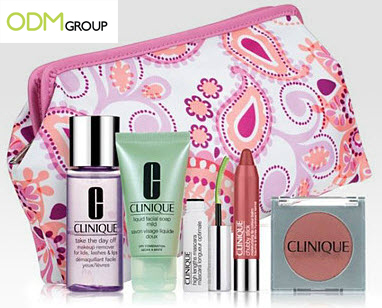 Clinique may brand its logo on the cosmetic pouch in order to increase brand awareness to potential customers. By doing so, they will also boost their brand recall so that existing customers are reminded to make repeat purchases for Clinique products. It will also facilitate free advertising to non-existing customers and attract them to buy Clinique’s products. The cosmetic pouch has high perceived value due to its design and theme. Customers will be enticed to spend more in order to get the free cosmetic pouch. This makes it easier for Clinique to upsell its products. It will also result in more impulse purchases. Therefore, this will increase sales for Clinique in return.